For Pearl and other sure-type (two characters on 1 key) model; hold Alt (Bottom left) and type EACE (character is not case sensitive). For Storm; hold the BACK arrow and tap the screen in the following area: TOP LEFT, TOP RIGHT, TOP LEFT, TOP RIGHT. 3. "Help Me" Menu will open. You need to look for PIN, App Version and Uptime information similar to above. Enter this information into the box below to generate the "Key Code". You must type the information into the box EXACTLY including the period, space, and parentheses. Key Code: Enter data above. 4. Once you have the Key Code. 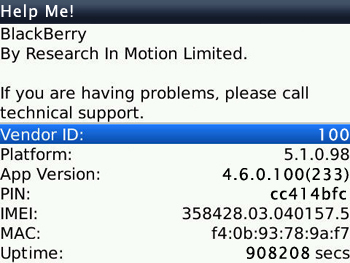 Type this Key Code directly into your Blackberry. Remember to press alt key for the number and release alt key for character (example: if Your Key is 7A00EF7B, you need to press alt 7, A, alt 0, alt 0, E, F, alt 7, B (character is not case sensitive). You will not see anything on the screen as the key is being type. 5. Engineering Screens Contents will open. 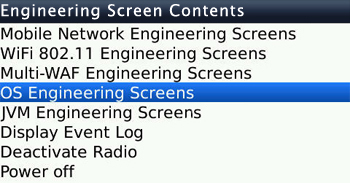 Select “OS Engineering Screens” and "Device information" will open. 6. Device information will open. 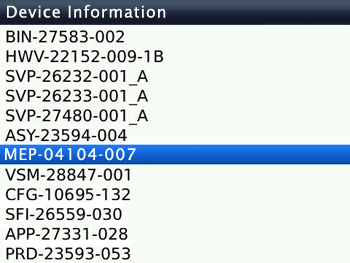 Scroll down and find your Blackberry MEP Name. For this sample, the MEP Name is 04104-007 (Your MEP Nmae may be different) Now you have your MEP Name, give us this MEP Name.